Sometimes loving a book can get you in trouble, especially in a movie theater. Everyone knows that guy behind them who mutters throughout the entire film about how such and such a line wasn't in the book and how the main character should wear a burgandy jacket, not a red one, dammit. For the most part, PCC wages these adaptation wars in the privacy of her own brain. But the tension still exists, building to a tidal wave of equal parts excitement and apprehension as the opening credits of the film adaptation of a beloved book roll on to the screen. Luckily, Clint Eastwood's adaptation of Dennis Lehane's bestselling novel, Mystic River rode the wave of excitement from the first glimpse of the Boston suburbs until the final somber notes of the Clint-composed theme faded out after the closing credits scrolled off-screen. Mystic River follows the lives of three boyhood friends, Jimmy (Sean Penn), Sean (Kevin Bacon) and Dave (Tim Robbins), starting on a fateful day when they were eleven and Dave was kidnapped off the street by two mysterious men masquerading as cops. We flash forward 25 years and find that the boys have become men with families of their own. Their lives are intertwined once again when Jimmy's daughter Katie is found brutally murdered in a local park and Sean, now a state policeman, is assigned to the case, which begins to focus on Dave as a suspect. 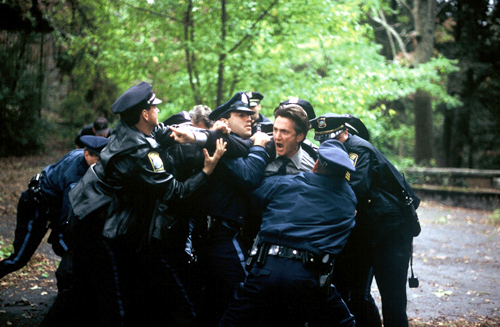 But Mystic River is so much more than a police procedural or a straight-up murder mystery. While Katie's murder serves as the catalyst that brings the men together again after so many years, Lehane's novel and Eastwood's film are more studies in grief, revenge and family than anything else. Lehane's prose is haunting, seamlessly weaving in and out of different characters' perspectives. With such an "interior", psychologically-driven book, PCC was afraid of how it would be translated on to the screen. But Eastwood nails the tone of the novel, the slowly building sense of dread that creeps along each page, and now through each shot of the film. It isn't a flashy book and Eastwood is wonderfully understated in his depictions of the events of the story. Even the discovery of Katie's body, which in other crime films might be edited together with the cadence of a music video, is sweeping and somber, like a layer of tar oozing over the frame and darkening the mood without a sound. But Eastwood's most remarkable accomplishments in the film are the performances he elicits from his leading men, as well as from Laura Linney as Jimmy's second wife and Marcia Gay Harden as Dave's wife. Sean Penn is breathtaking to watch. You feel his pain, but not because he's forcing it on you, but because he's so open and raw and honest about it that you can't help but take a deep breath and remind yourself that it's only fiction. His monologue on the porch steps with Tim Robbins should convince anyone still out there who doubts his astonishing gift for complete character subsumption that Penn is one of the finest actors working today. Laura Linney is wonderfully cold and controlling as the pragmatic Annabeth, always in control behind the shadows. The final scene, devoid of dialogue but chockful of emotion, between Annabeth, Jimmy and Celeste (Harden) should be included on the list of most powerful closing scenes in recent memory.